Baseball Hall of Famer and trail blazer Frank Robinson died Thursday in Los Angeles, according to multiple reports. He was 83. Per the New York Daily News, Robinson died after a battle with bone cancer. Robinson crafted a Hall of Fame career from deft skill with the bat and a fiery personality. Those attributes allowed him to finish his playing days with 586 home runs — fourth-most ever at the time and now 10th on the all-time list. 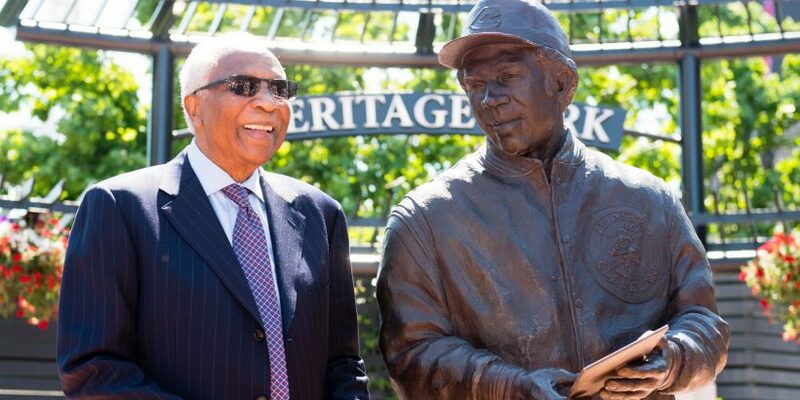 He later became MLB’s first black manager with the Indians and eventually guided four franchises in four different decades. Affectionately nicknamed “Pencils” for his thin stature growing up, Robinson was born in Beaumont, Texas, but spent his high school years in Oakland, Calif., where he played basketball alongside Hall of Famer Bill Russell. Robinson finished his career outscoring Russell on that same team. But basketball wasn’t for Robinson, who went on to sign with the Reds out of high school for $3,000. From the moment he broke into the majors, he was one of the best players in the game. Robinson was named the NL Rookie of the Year in 1956 after hitting 38 home runs and driving in 83 runs. The 38 homers were the most by a rookie until Mark McGwire hit 49 for the Athletics in 1987. The mark has been bested only three times since Robinson set it. Aaron Judge of the Yankees (52) and Cody Bellinger of the Dodgers (39) both surpassed it in 2017. A fierce competitor, Robinson played 10 seasons in Cincinnati making six All-Star teams and winning the MVP award in 1961. He would move on to the Orioles in 1966, where he would win an MVP in his first season with the club — becoming the only player to win the award in both leagues — as he led the team to a World Series victory while winning the Triple Crown with a .316 batting average, 49 home runs and 122 RBIs. He would win two World Series titles in his six years with the Orioles. While Robinson was fiery on the field, he was even more so off it as he fought for civil rights for much of his playing career especially once he moved to Baltimore. After witnessing the city’s segregated housing and discriminatory real estate practices, Robinson became an enthusiastic speaker on racial issues. Robinson also was outspoken about white pitchers not being openly rebuked for throwing at black batters. After he was traded to the Indians in 1974, he was named the team’s player-manager in 1975. He would manage the Indians for two years before he was fired. His career didn’t end there, as he would go on to become the first black manager in the National League with the Giants (1981-84). He also managed the Orioles (1988-91) and the Expos/Nationals (2002-06), compiling a career record of 1,065-1,176 (.475) across all or parts of 16 seasons. Robinson finished his playing career among all-time leaders in multiple offensive categories including home runs (586), RBIs (1,812), runs scored (1,829) and walks (1,420). He is one of only three MLB players ever to have his number retired by three teams, along with Nolan Ryan and Jackie Robinson. « With Realmuto joining Phillies, could Harper or Machado follow?